Real-time PCR was employed to detect a conserved region of the P1 cytadhesin gene of Mycoplasma pneumoniae in combined nose and throat swabs collected from patients attending GP surgeries during 2005–2009 with symptoms of respiratory tract infection (RTI). Samples were collected as part of an annual winter epidemiological and virological linked study in England and Wales. A total of 3,987 samples were tested, 65 (1.7%, 95%CI 1.3–2.1) had detectable M. pneumoniae DNA. Positive patients were detected of both gender, aged from 9 months to 78 years, who had clinical signs of upper RTI, fever and/or myalgia, an influenza-like illness to lower RTI. Mixed infections were identified in four cases, two with influenza A H1, one with H3 and one with influenza B. 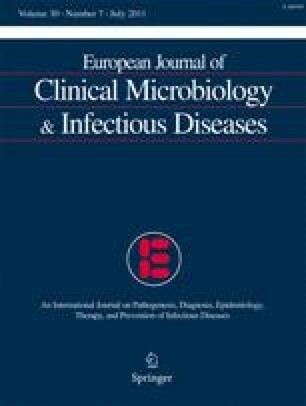 Children aged 5–14 years were more likely to have detectable M. pneumoniae in samples than all other age groups (Fishers p = 0.03), attributed to the 2005–2006 season in which 6.0% (12/200, 95%CI 3.4–10.3) of 5–14 year olds had detectable M. pneumoniae in comparison to 2.2% in 2006–2007 (3/141 95%CI 0.5–6.4), 2.2% in 2007–2008 (2/89 95%CI 0.1–8.3) and 0% in 2008-2009 (0/151 95%CI 0–2.9). The authors would like to thank the Birmingham Research Unit of the Royal College of General Practitioners, the HPA Surveillance of Influenza Group, CDSC HPA for Fig. 1, Tony McNiff for IT assistance, and Carmen Sheppard and Catherine Brown for Hertfordshire carriage data.